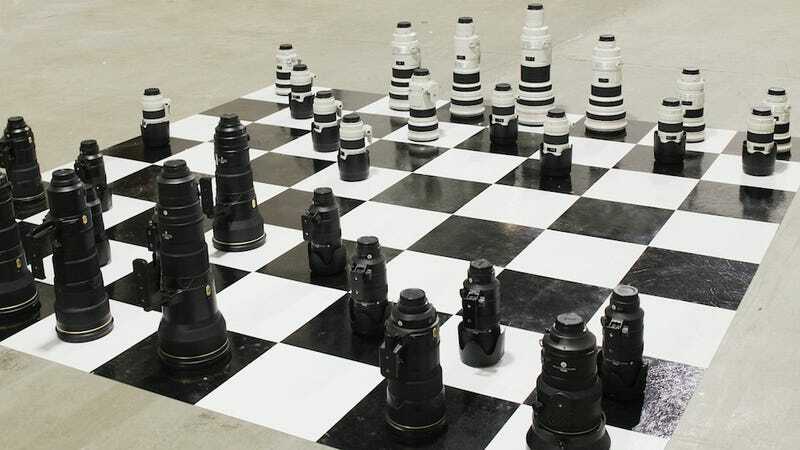 The dudes over at LensRentals had too much time on their hands, so they staged a game of chess between their inventory of Nikon and Canon lenses. You can do the same too, for nearly $10,000/week. LensRentals will ship you the entire set, which will cost at least $1,000 in shipping, but they point out that all the pieces have image stabilization. The complete 32 piece set includes 70-200 f/2.8 pawns, 600mm f/4 Kings and 500mm f4 Queens, 400mm f/2.8 Bishops, 300mm f/2.8 Knights, and 200mm f/2.0 Rooks in black (Nikon) and white (Canon). If you don't already have an appropriate size chess board we will throw in a complete set of 32 white and 32 black stick-on 12" square vinyl tiles so you can create your own.